I do lots of monitoring on my site (I’d rather watch logs than Netflix) which I’ll talk about in separate posts, but today I want to talk about SSH. I’m going to cover how I log, how I get those longs into Splunk, and what kinds of searches and alerts I have set up. First off, I’m running Ubuntu 16.04, and SSH natively logs to /var/log/auth.log. So the first thing I do is go to Settings –> Data Inputs –> Add Data within Splunk, and then add /var/log to the inputs. That basically makes it so that Splunk monitors every log file coming under that directory, which is most logs on an Ubuntu system. Image 1. — Telling Splunk to monitor a directory. Who’s trying to log in with an invalid user? What user are they trying to use to log in? The first question requires us to look for invalid user entries in the logs. The second requires us to extract that user out of the log. And the third question requires us to get geolocation from the connecting IP address. So within Splunk, there are a few tools that help us do this. 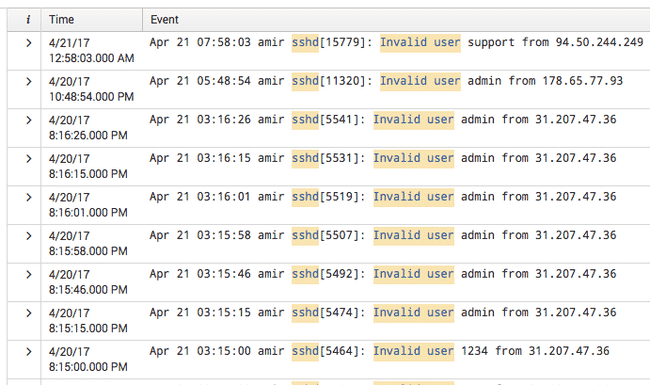 To find invalid users you simply search for entries like that in the logs, and the string happens to be, literally, “invalid user”. You get some junk in those results which you can clean up with a couple of NOT statements, leaving you with the following search. Image 2. — Your starting query. Image 3. — A basic search result. This is decent, but we can do better. 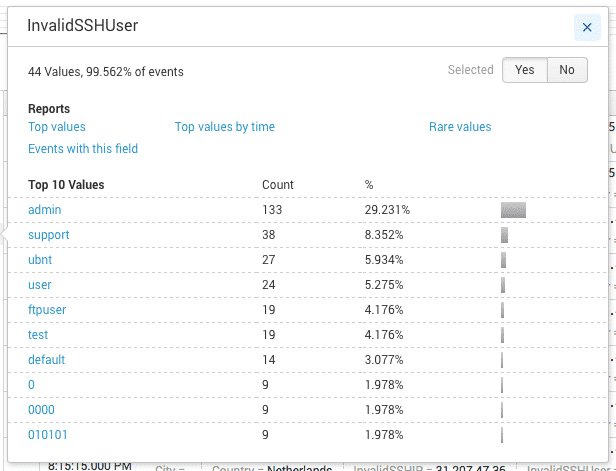 You can see that we have invalid users here in each entry—in this case admin, but the power of Splunk is taking fields inside of raw log files and turning those into actual fields you can manipulate and play with. For that, we need to do some field extraction. To do that, click on the “>” in any individual search result, click the Event Actions pulldown, and select Extract Fields. Image 4. — Starting a field extraction. First we’re going to extract the invalid user, and we do that by picking the Regular Expression option, selecting the word “admin” in the log, and saving it as SSHInvalidUser. Now we have that as a field, which looks like this in search. Image 5. 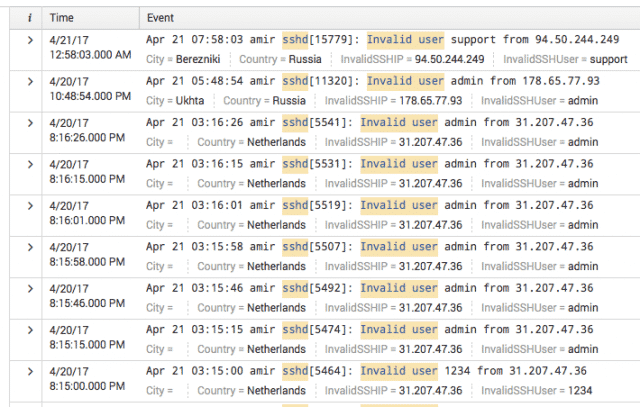 — A result with the invalid SSH user extracted. Now to figure out who’s launching these attacks against us, we’re we need to convert that IP address we see into a location. Splunk does this automatically now with a built-in function called iplocation. But first we need to extract that IP into a variable of its own. Then we add the following to our search query: | iplocation InvalidSSHIP, which looks like this. Image 6. — Search results with geo information. Which then gives us these interesting new options to the left of the results. Image 7. — New field labels. We now have “City” and “Country” as options, and further down we have “Region” as well. So Splunk has automatically translated all those IPs into locations. Image 8. — Search results with all fields visible. That’s coming along nicely. We can now see the country, the city, and the username they tried to log in with! Now that we have the components in place, we can start having fun with what Splunk does for us automatically. The fields to the left area all clickable. Image 9. — Clickable field names. 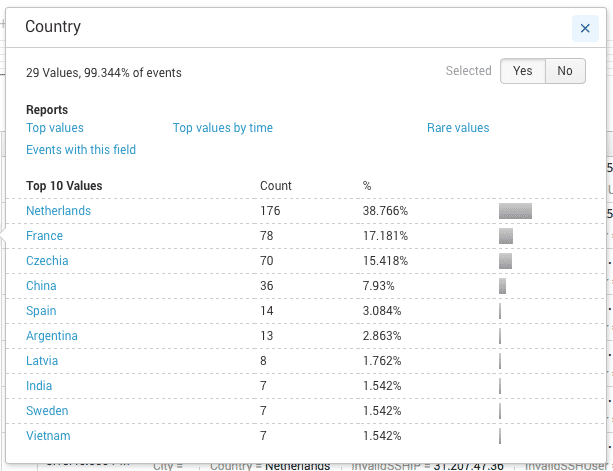 And when you do click on them, they expand out into a statistical view. Image 10. — Top attacking countries. Image 11. — Top attempted usernames. And then finally, graphing the results by clicking “Top values” in one of those boxes. Image 12. 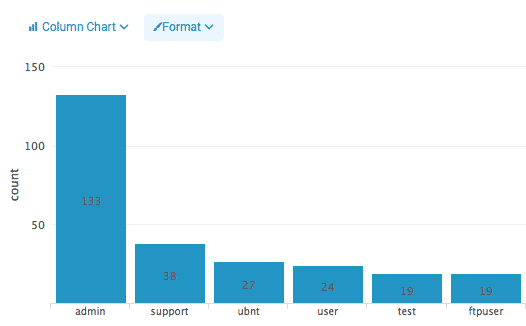 — Top attempted users shown as a bar chart. Bottom line here is that it’s possible to do all kinds of fun stuff with default SSH logs, a free Splunk installation, and just a few minutes. I didn’t mention how to install Splunk on Ubuntu, but it’s basically a two minute process. You download the latest .deb package from the Splunk website and do dpkg -i $PACKAGENAME. That’s it. I don’t work for Splunk nor have any relationship with them. If I did I’d say so clearly at the top when I mentioned the product. I’ve just loved and used the product for years.